Wake Forest’s Class of 2013 was reminded that timing is everything at Commencement on May 20. Following a weekend of rain that continued into Monday morning, the precipitation stopped long enough – barely long enough – to allow Commencement to proceed as planned on Hearn Plaza. A ceremony that began with students delivering the welcome in half a dozen languages concluded with heavy rain falling, almost on cue, as it ended. 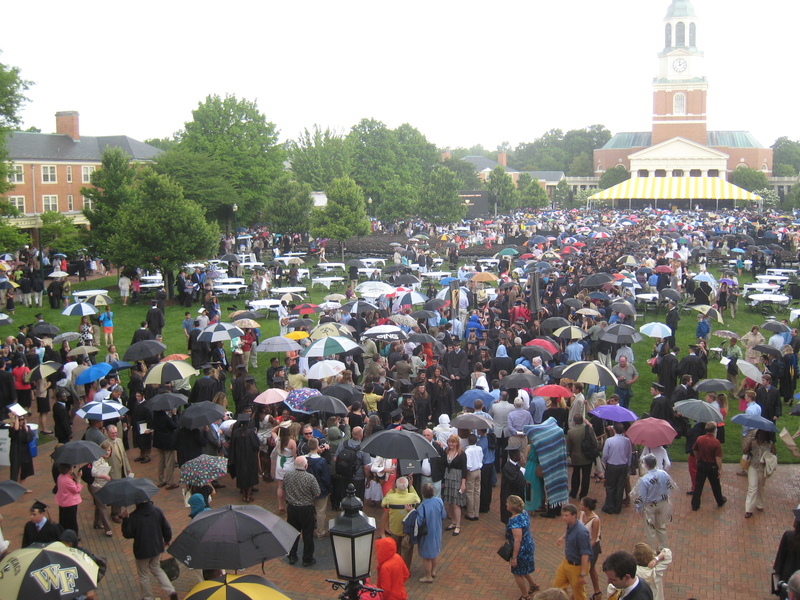 Stuck in a long line for the recessional, graduates struck up a cheer of “Wake!” “Forest!” amid the downpour. Faculty members pulled out umbrellas and gamely lined up in front of Reynolda Hall to applaud, hug and congratulate graduates. 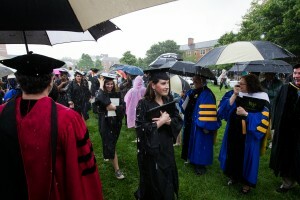 The rain ended within minutes, giving soaked graduates, family and friends time to take pictures and savor the moment. It was perhaps the closest rain has come to disrupting the ceremony once the decision was made to proceed outside since 2001 — when light drizzle was falling as the ceremony began. Since Commencement was held for the first time on Hearn Plaza in 1966, rain has forced the ceremony inside only four times — in 1973 and 1983 when it was held in Wait Chapel, and in 1991 and 2010 when it was held in Joel Coliseum; a wind storm in 1989 knocked down the tent the night before Commencement, but the ceremony proceeded, without a tent. About 1,700 members of the Class of 2013 — 1,000 undergraduate and 700 graduate and professional students — received degrees during a ceremony that began under muggy overcast conditions and turned cooler as heavy clouds began moving over campus three hours later. Sydney Shirley and Meggy Hearn show off their red Chuck Taylor sneakers. Hearn — no relation to former President Thomas K. Hearn Jr. — and Shirley, a psychology major from Raleigh, N.C., were sporting red Chuck Taylor sneakers, worn by the graduating members of their sorority, Chi Omega. Shirley’s twin brother, Jefferson, also graduated; their mother, Kimberly Boatwright Shirley, graduated in 1985. 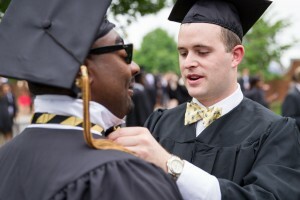 Mark Covington (’13) gets a little help with his bow tie from Landon Baucom (’13). 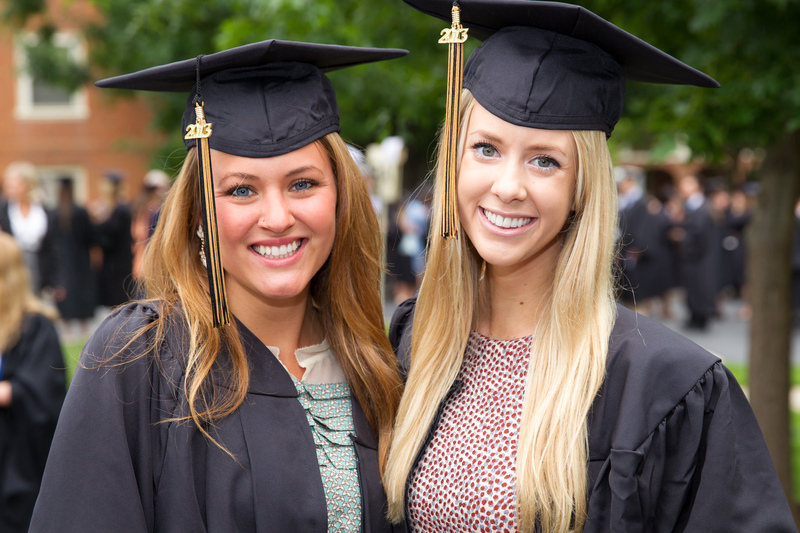 Lauren Martinez (’13) and Katie Mahone (’13). 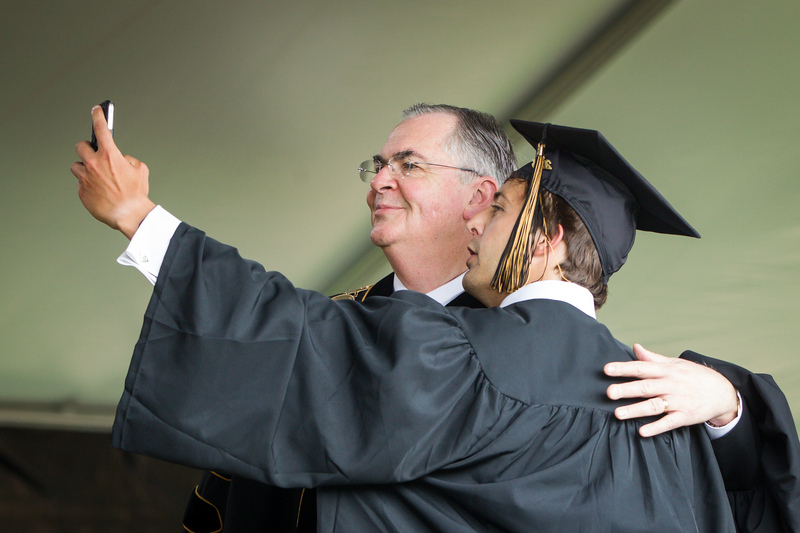 At Wake Forest’s first Commencement to integrate social media, students and parents were encouraged to tweet during the ceremony – tweets using the hashtag #wfugrad appeared on Jumbotrons – and share photos on Instagram. 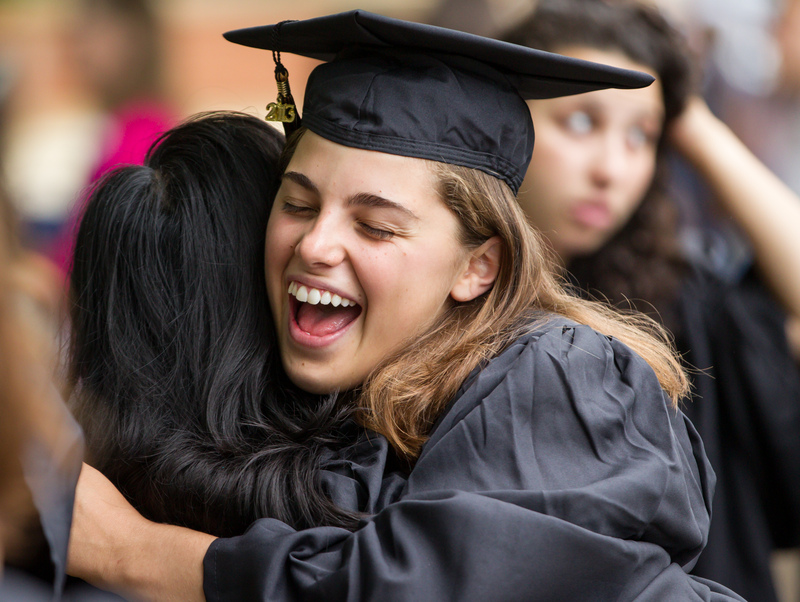 Over 1,150 tweets using #wfugrad were sent before and during the ceremony, and more than 500 photos tagged with #wfugrad were posted on Instagram. 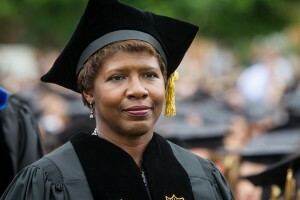 Television journalist Gwen Ifill, who delivered the Commencement address, even got in on the action, taking to Twitter several days before her speech to ask graduates for suggestions on what she should say. During her speech, she paused to take out her phone and snap a photo of the audience for her Twitter feed. Chad Brady takes a self portrait with President Hatch as he crosses the stage. Also during the ceremony, retiring faculty from the Reynolda and Bowman Gray campuses were recognized (see list below). Hatch recognized long-serving staff members Toby Hale, Ken Zick and Harold Holmes. Hale (’65, P ’03), an associate dean of the college, is retiring after 43 years. Zick is stepping down after serving as vice president and dean of student affairs for 25 years, but he will remain on the faculty. Holmes, associate vice president and dean of student services, is retiring after 25 years. Emma Huntsinger (’13) hugs a friend. Five honorary degrees were awarded during the ceremony. Ifill received an honorary Doctor of Humane Letters degree. Carolyn Y. Woo, president and CEO of Catholic Relief Services, received an honorary Doctor of Humane Letters; she delivered the Baccalaureate Address in Wait Chapel on May 19. Honorary degrees were also awarded to: Janet Murguia, president and CEO of the National Council of La Raza, the largest national Hispanic civil rights and advocacy organization in the United States, Doctor of Laws; and David S. Wilkes, executive associate dean for research affairs at Indiana University School of Medicine, Doctor of Science. 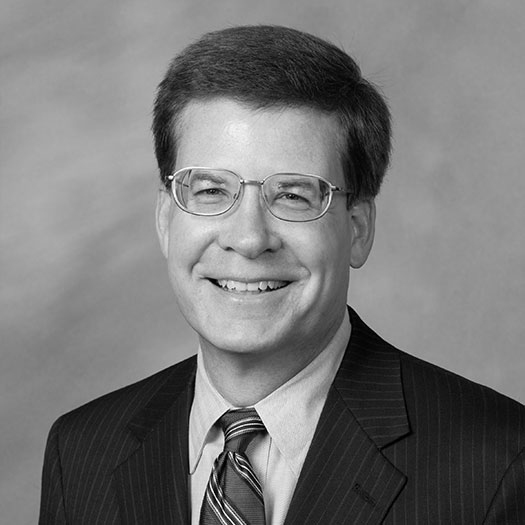 The late Michael A. J. Farrell (P ’10), co-founder, chairman and CEO of Annaly Capital Management and the lead donor to Farrell Hall, was honored with a posthumous Doctor of Laws degree.